TSPSC Civil Assistant Surgeons Results, Certificates verification schedule 2018: TSPSC Civil Assistant Surgeons 2017 Recruitment, , Preliminary Anwer key, Main Anser Key, Results. TSIMS Civil Assistant Surgeons 2017 Recruitment, TSVVP Civil Assistant Surgeons Recruitment 2017. TSPSC Civil Assistant Surgeons 2017 Recruitment in TS Insurance Medical Service and TS Vaidya Vidhana Parishad. 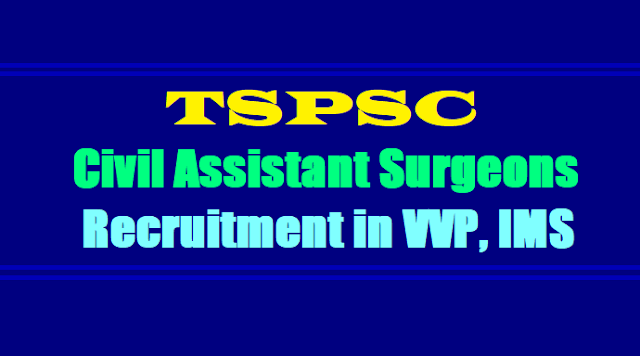 TSPSC has published the Civil Assistant Surgeons 2017 recruitment notification and Applications are invited Online from qualified candidates through the proforma Application to be made available on Commission’s WEBSITE (www.tspsc.gov.in) to the post of Civil Assistant Surgeon Specialists in Telangana Vaidya Vidhana Parishad (HM & FM Dept) in the State of Telangana. The proforma Application will be available on Commission’s Website (www.tspsc.gov.in) from as per its schedule and the last date for payment of fee, Schedule and more details are available on tspsc web portal. AND Applications are invited Online from qualified candidates through the proforma Application to be made available on Commission’s WEBSITE (www.tspsc.gov.in) to the post of Civil Assistant Surgeons in Insurance Medical Service in the State of Telangana. TSPSC has informed that, in compliance with the final orders of the Hon’ble High Court in W.P.Nos.22313 of 2018 and 30125 of 2018 the Result Notification for withheld posts of Civil Assistant Surgeon Specialists of ENT and Obestetrics and Gynaecology in Telangana Vaidya Vidhana Parishad (Health Medical &Family Welfare Department) vide Notification No. 40/2017, is available on the Commission’s web site (www.tspsc.gov.in). TSPSC has informed that the Result notification for withheld posts of Civil Assistant Surgeon Specialists of Anaesthesia, General Medicine, Obestetrics and Gynaecology, General Surgery and ENT in Telangana Vaidya Vidhana Parishad (Health Medical &Family Welfare Department) vide Notification No. 40/2017 In compliance with the final orders of the Hon’ble High Court in W.P.Nos.18198 of 2018, 18122 of 2018, 18253 of 2018, 18481 of 2018, 23758 of 2018 & 31466 of 2018, and letter received from the Principal Secretary to Government, HM & FW Department is available on the Commission’s web site (www.tspsc.gov.in). TSPSC informed that in continuous of Result Notification dated 28/08/2018, on the basis of the result of the written examination held on 23-10-2017 F.N. & A.N. and Verification of Certificates held on 19/05/2018, 21/05/2018, 22/05/2018, 22/06/2018, 12/07/2018 & 13/07/2018 and Oral test (Interview) for 257 candidates held on 20/08/2018, 21/08/2018, 25/08/2018 & 27/08/2018 at TSPSC Office, Hyderabad to the post of Civil Assistant Surgeon Specialists in Telangana Vaidya Vidhana Parishad (Health Medical & Family Welfare Department) in compliance with the Final Orders of the Hon’ble High Court in following 09 W.P.Nos.18198 of 2018, 18122 of 2018, 18253 of 2018, 18481 of 2018, 23758 of 2018 & 31466 of 2018 and as per the letter received from the principal secretary to Government, HM & FW Department, the following Hall ticket numbers have been provisionally selected for the posts which were kept withheld in view of the pending Court Cases. The selections are published herewith subject to the following conditions. 1. That success in the examination confers no right to appointment unless the appointing authority is satisfied after such enquiry as the case may be considered necessary, that the candidate having regard to her/his character and antecedents is suitable in all respects for appointment to the service. 2. That the candidate is found physically fit for the post. 3. That the candidate should produce such original certificates as required in accordance with the rules/notification. TSPSC will conduct the Interview for the posts of Civil Assistant Surgeon on 20-08-2018 by 10.00 AM in the office of TSPSC at Prathibha Bhavan, Nampally, Hyderabad and for more details please visit the tspsc website. The Oral Test (Interview) for the post of Civil Assistant Surgeon Specialists is scheduled to be held from 20/08/2018 from 10:00A.M onwards at TSPSC Office, Prathiba Bhavan, M.J. Road, Nampally, Hyderabad. For the list of candidates, Schedule of Interview and further details can visit Commission’s website www.tspsc.gov.in . On the basis of the written examination held on 23/10/2017 F.N. & A.N. and Verification of Certificates held on 19-05-2018, 21-05-2018, 22-05-2018, 22-06-2018, 12-07-2018 and 13-07-2018 to the post of Civil Assistant Surgeon Specialists in Telangana Vaidya Vidhana Parishad (Health Medical & Family Welfare Department), the candidates with the following Hall Ticket Numbers have been Provisionally admitted for the Oral test (interview). 2. The candidates who have qualified for Oral Test (Interview) are required to attend Interview from 20/08/2018 at 10.00 A.M onwards at TSPSC Office along with hall ticket, Original Certificates and two (2) Passport size photos as per schedule. 4. Certain candidates are called for Interviews in compliance with Interim orders of Hon’ble High Court subject to final orders. Schedule for Interviews for the post of Civil Assistant Surgeon Specialists Notification No-40/2017. Result for Interview for the post of Civil Assistant Surgeon Specialists Notification No-40/2017. In continuation of Notification for Verification of Certificates dated 15/06/2018. it is hereby notified that on the basis of the Written Examination held on 23/10/2017 F.N & A.N to the posts of CIVIL ASSISTANT SURGEON SPECIALISTS IN TELANGANA VAIDYA VIDHANA PARISHAD (HM & FW DEPARTMENT) the candidates with the following Hall Ticket Numbers are provisionally admitted for verification of Certificates. Due to rejections and absentees in two spells, all the qualified candidates in the examination are now being called for certificate verification to avoid repeated certificate verification phases and to speed up the recruitment process. After verification of original certificates, provisional list of eligible candidates for interview will be announced separately, subject to outcome of court orders if any. Mere call for certificate verification does not confer a right to selection and eligibility will be determined after certificate verification. 3. The verification of certificates will be held in the office of TSPSC at Prathibha Bhavan, Nampally, Hyderabad held on 12/07/2018 & 13/07/2018 from 10.00 AM onwards. The candidates are instructed to obtain and keep ready all the certificates as mentioned in the Notification. TELANGANA STATE PUBLIC SERVICE COMMISSION: HYDERABAD NOTIFICATION NO. 40/2017. Dt. 15/08/2017. the posts of CIVIL ASSISTANT SURGEON SPECIALISTS IN TELANGANA VAIDYA VIDHANA PARISHAD (HM & FW DEPARTMENT)) the candidates with the following Hall Ticket Numbers have been provisionally admitted in the ratio of 1:2 the verification of Certificates. 3. The verification of certificates will be held in the office of TSPSC at Prathibha Bhavan, Nampally, Hyderabad held on 22/06/2018 from 10.00 AM onwards. The candidates are instructed to obtain and keep ready all the certificates as mentioned in the Notification. Sl.No. Name of the Post No. of Vacancies Age as on 01/07/2017 Min. Max. Scale of Pay Rs. Must possess Post Graduate Degree/ Diploma examination or its equivalent in the concerned specialty form a College recognized by the Medical Council of India. Must be registered on permanent basis, with Telangana State Medical Council. ii) Must be a permanent Registered Medical Practitioner within the meaning of law for the time being existing in the state. Age limit: Candidates age limit should have minimum 18 years and maximum 44 years. Appointment to the posts will be made by examination (objective type) by Online/ OMR based. In case screening test is conducted as referred above, based on the Merit in screening test, candidates will be picked up in the ratio of 50 per one notified post for the main examination in order of General Merit. In case where no screening test is held, all the eligible applicants would be allowed to appear for the main examination. The final selection of candidates for appointment to the posts shall be based on the merit in the computer based main Examination, to be held as per the scheme of examination enunciated at para 7 in notification. Application processing Fee and Examination Fee and they are not entitled for any kind of reservation. Before applying for the post, an applicant shall register his/her bio-data particulars through One Time Profile Registration (OTPR) on the Commission Website viz., www.tspsc.gov.in. Once applicant registers his/her particulars, a User ID is generated and sent to his/her registered mobile number and email ID. Applicants need to apply for the post using the OTPR User ID through Commission’s website. TSPSC Civil Assistant Surgeons 2017 Recruitment Test Hall tickets: Hall tickets can be downloaded 7 days before commencement of Examination. The candidates who applied for the posts of Civil Asst Surgeons (40/2017), Civil Asst Surgeons (44/2017) are requested to note the examination dates for various posts as mentioned herewith.